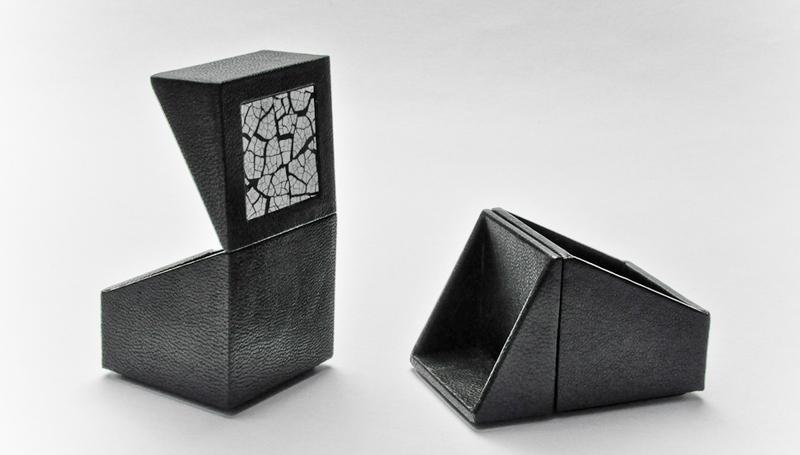 This is the second design in a series of magnet hinge cube ring boxes. 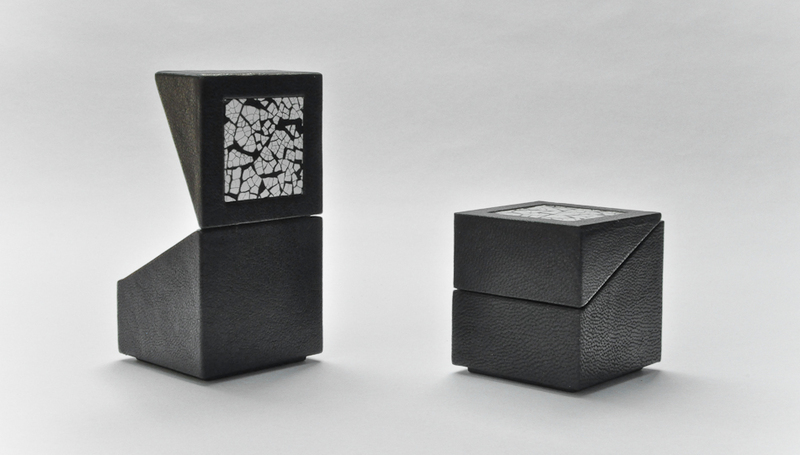 The form is simple and elegant, but the real fun is in the hinge that I developed for this little box. The seamless hinge can be at first handling a bit enigmatic, but it functions gracefully and intuitively and it is simply fun to have in your hands. The lid gently snaps up, down or back, and can even be removed completely. The hinging mechanism consists of a band of neodymium magnets embedded in the edge of the lid and the base which form a strong bond while still allowing the lid to rotate up and down with ease. Additionally, the strength of the magnet keeps the lid snapped shut, so there is no need for an additional latch or closure. As a bookbinder and box maker, hinges are always a present concern. The standard method is to use the leather, cloth or paper covering material to form the hinge, sometimes with additional reinforcement. But sometimes materials break down with repeated use, or simply don’t have the sufficient combination of strength and flexibility to function well. Others may be thin, strong, and flexible, but may not have the right aesthetic character or may be a headache to work with. Alternatively, I’ve constructed [pin and tube hinging for boxes] and variants of [Dan Kelm’s very versatile wire edge hinging structures] which are both wonderful methods. For this, however, I wanted something different: something clean, and simple. Tinkering in my studio with an ample supply of magnets yielded a fun idea that subsequently evolved into this design. Now I’m looking forward to working out further possibilities for this technique! 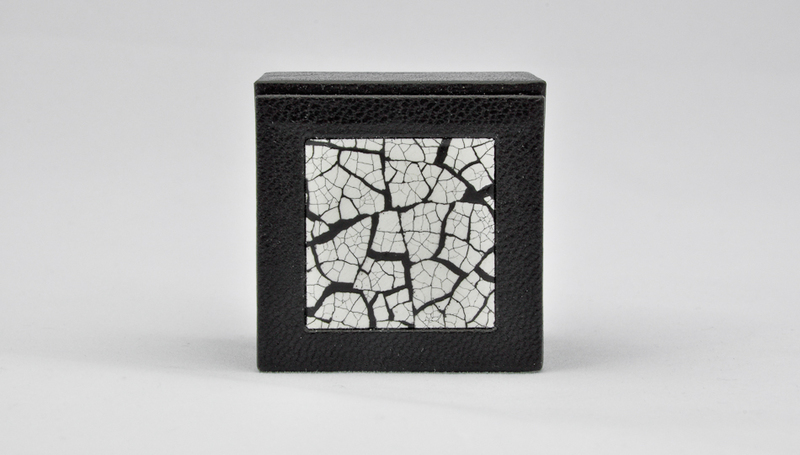 The cube shaped box has a fully lined leather interior and may also be fitted with a tarnish protective ring cushion for optimal storage and presentation. The inset panel on the lid is a lacquered eggshell mosaic done in the spirit of Swiss artist and designer Jean Dunand, who famously mastered the technique of using of coquille d’oeuf to color and pattern lacquered furniture, panels, and vases.